Goal: Execute a battery of of captive portal logins from virtual wifi stations using the newer script. 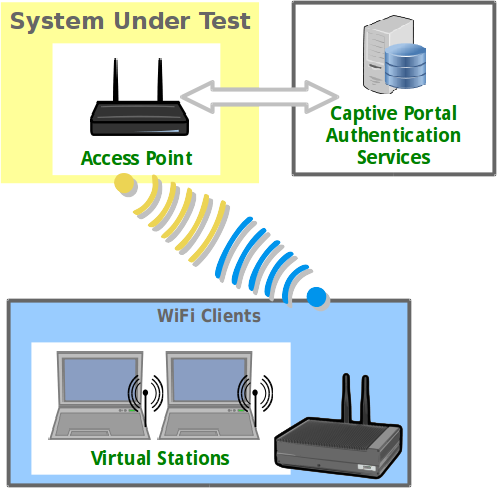 Public access open WiFi service is often gated with a web sign-on form (a captive portal). LANforge virtual stations can emulate sign-in to the captive portal using the portal-bot.pl script. 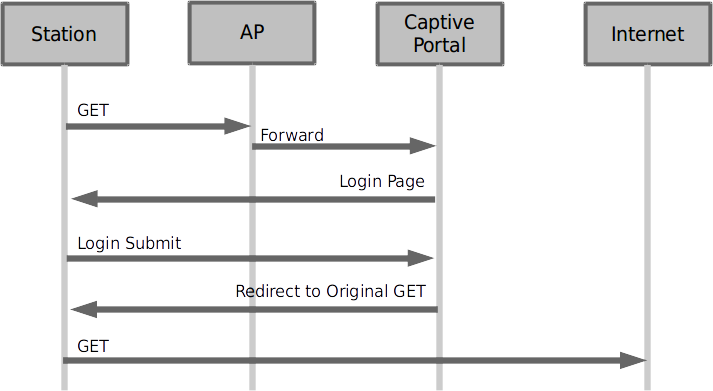 This script is by necessity incomplete because many captive portals have different behaviors and login form requirements. With this script, you provide a bot plugin that bridges the gap. This cookbook will coach you through a basic portal-bot integration and then you will create ten stations that authenticate through a captive WiFi portal. 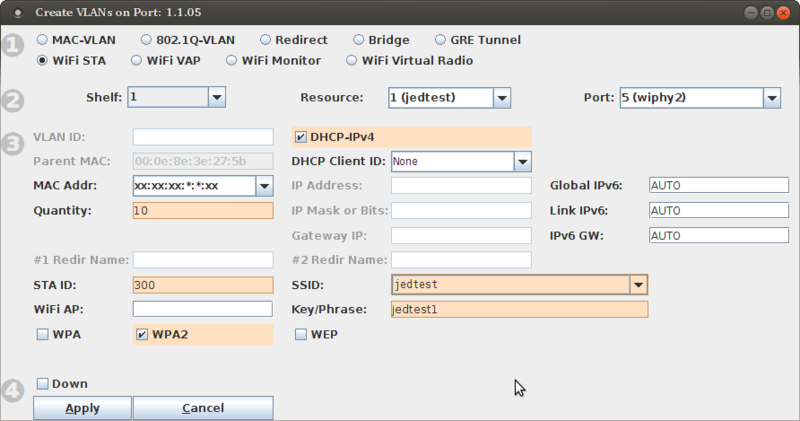 In this example, we will be testing agains a simple LAMP server on the upstream side of the AP. Do no use your LANforge server as the LAMP server because the routing will be difficult. 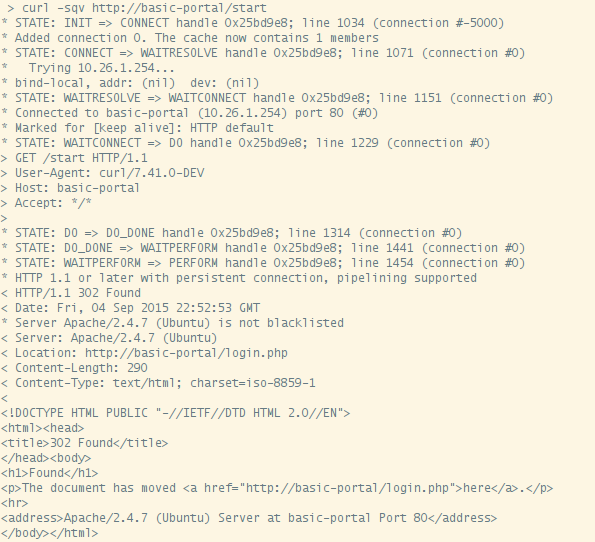 In this chapter, a LAMP server is at 10.26.1.254, and there is an /etc/hosts entry for basic-portal to that address. 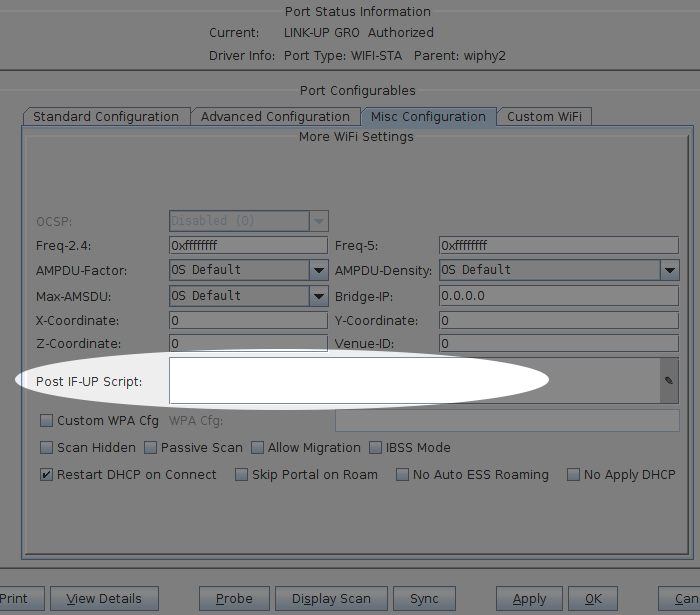 A WiFi station accesses the LAN and is assigned a DHCP address. The station user submits this form. This form knows where to submit itself to, but it is possible that the form does not submit to the same address or service that it came from. The originally requested page, either as a 301-Redirect or as a proxied result. 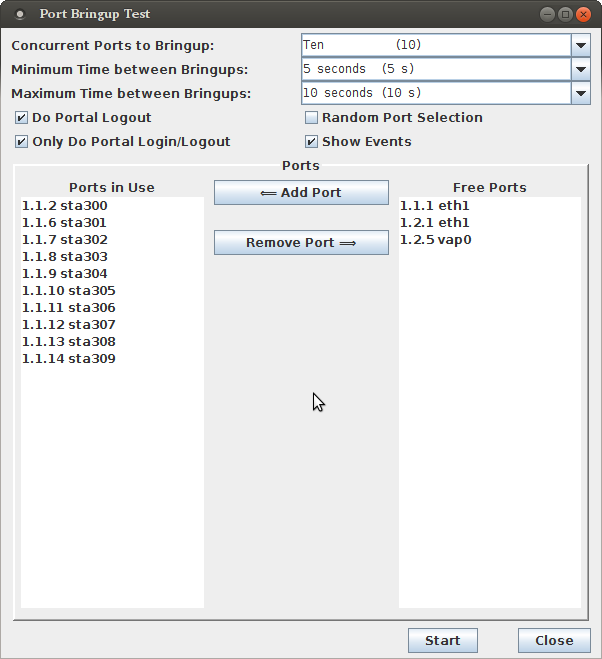 A portal-iframe providing a logout or service menu and the original content inside. If you wish to set up a login and logout page on an Apache/PHP server to test with, you can copy the below files to the /var/www/html directory on the LAMP server. <?= $_POST['username'] ?> access granted. You can use the command curl -sqv http://basic-portal/start to test out the redirect you just created. The portal-bot.bash script is for exercising your portal-bot.pl script options from the command line while you develop with it. This is very close to the values you will place in the Ports→Misc/Post IF-UP field. You will never place the PBOT_NOFORK option in the Ports→Misc/Post IF-UP field because that will interrupt the processing of the LANforge Manager process. You will also never place $* in that field, either. You can place the --verbose and --debug flags in there, but it can fill your disk with log output more quickly. A common misconception is thinking that $* is a command-line argument. It is only used in bash scripts. Do not put $* on the command-line. First thing to do: edit a copy of that script and adjust it for your station device and it's IP address. Add -d to add more debugging messages. That makes dbg() statements print. Add --print after you get the script to work. This will print out the format of the arguments useful for putting the statements into the GUI Ports→Misc/Post IF-UP field. The first six arguments are provided by LANforge when you use portal-bot.pl with a station. You want to populate these in your bash script, but not in the Post IF_UP field. This environment variable tells the portal-bot.pl script to not fork. Use it only when developing. Omitting this is normal and allows for multi-processing of web requests from LANforge. The IP of the station. This script is useless if there has been no DHCP lease. 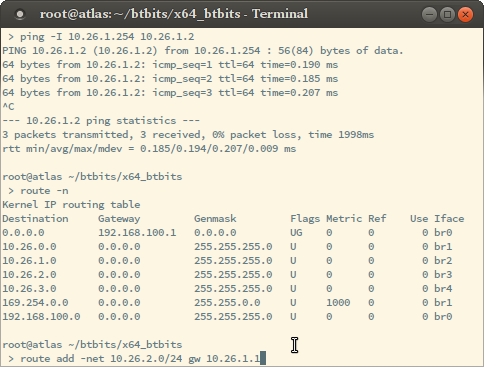 Use '' for no IPv6 address. The FIFO that signals the LANforge server. You don't use it when testing. A string to prepend to URLs when talking to the AP. Not necessary, but if you don't use it, you have to provide fully qualified URLs to --login_form, --login_action, and --logout_form. The first URL requested from the AP, this should provide either a login page or a redirect to a login page. If you get your destination page (like, if you request baidu.com and actually get it), your station has probably not been logged out from the captive portal. This is what you request to get a login form. Often it is returned in the redirect, but sometimes you cannot get a cookie assignment if you do not request it specifically. Submit your login credentials to this URL. $::delays Used to delay the 'submit_logout' request. Verbose and debug output, respectively. Skips process and prints out formatted arguments. We will connect to our LANforge system*. You want to copy this file to your own ./portal-bot.bash file, edit it and then make it executable. 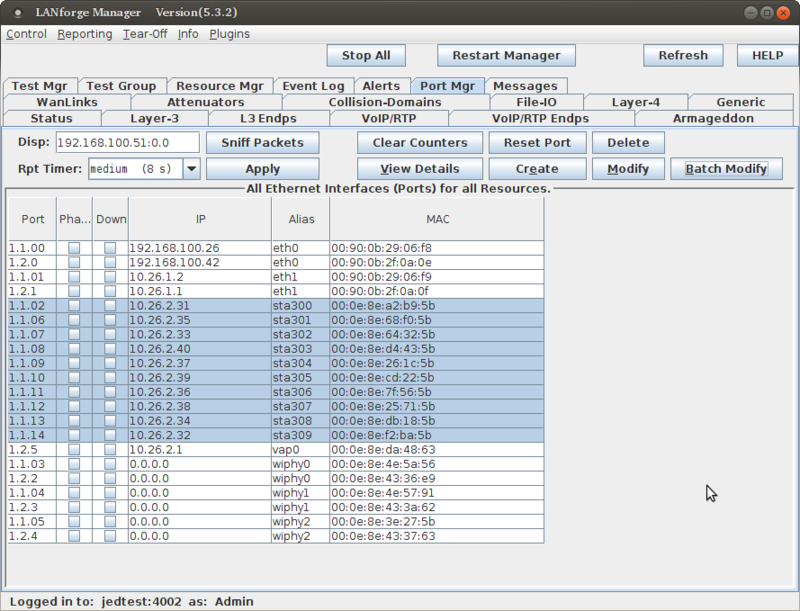 * You can connect via VNC, PuTTY or other SSH client. Use chmod +x portal-bot.bash to make your script executable. You will see a lot of output, it will show the contents of the web pages it finds. To find the actual curl commands being executed, you want to grep the logs. Below is an example of grepping the logs and running the curl command. There are many arguments to the curl command, but in general, you should be able to copy and paste the command into a terminal and it should work (see note about lanforge.profile above). Below is an example of a curl command, with \ characters as line-continuation marks, formatted for clarity. Your portal-bot.bash script is intended to be a way of focusing on the development of your bot plugin and not repetitively typing a long curl command. Your bot plugin, the Perl module you will write for your captive portal, is central to the operation of the portal-bot.pl script. It is also important that you do not alter the portal-bot.pl script unless absolutely necessary, because your changes could be overwritten by upgrades. Any alteration to the time at which the fork() call is made in this script can make the LANforge server grind to a halt. Only edit your bot perl module, please. If you get a redirect to another port, compare the --login_url value to this. If it is different, consider updating your login_url parameter. There might be many form parameters, like ones for a session id, a PHP_SESSID, a cookie, a base64 encoded string indicating your originally requested url (or just a plain URL-encoded url), and any possible co-branding parameters that might indicate any advertising campaigns associated with this captive portal. Missing some of these might make submitting the form give you an error. Store these values as necessary in your bot:: namespace. You do not submit your login page in this method. Define a package scope variable using our $thing; after your package statement. Here is where you submit your login page forms. The botlib::request() function is provided to make GET and POST requets verbose logging and debugging. The page is returned as lines in the @response array. The submit_login function uses the $::delay parameter if --delays were set. See paragraph on randomDelay. Here you determine if you are getting an access denied error or are being forwarded to your original start_url destination. Set your $result variable to OK or FAIL. 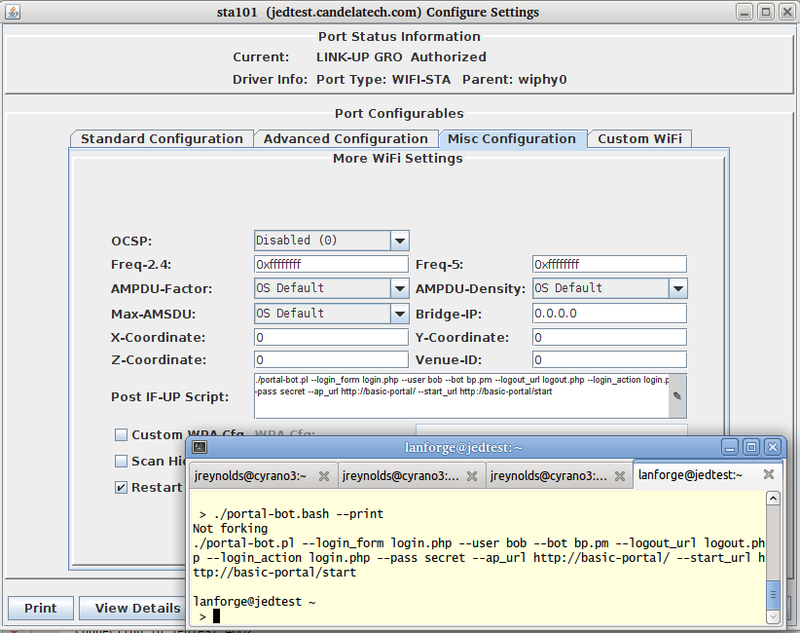 Use the logg() method to add information for the wifi/portal-bot log. Many captive portals do not publicise their logout URLs, so it might be available only on an admin page for the AP. You will know when the logout_url parameter works if you can do a logout with that station, and then successfully log back in using the same station and seeing the captive portal sign-in page again. A simple number is a simple delay in seconds. No other units are used. If you specify 'random' in the delay parameter, the botlib::randomDelay() is called, producing a range between [1 - 119] seconds. If you specify '3-16', randomDelay(3, 16) is called to produce a random range between [3 - 16] seconds. If you specify two numbers separated by a comma, it looks at your @::delays list, and picks the second argument if it can, the last item of @::delays if the list is too short, or the first argument if there are no items in the delay list. We have now covered all of the scripting development areas for the portal-bot.pl plugin you will write. Use the portal-bot.pl --print command to print out the arguments. Copy the result (starting with "portal-bot.pl") into the Port->Misc window. Avoid populating this field while you are developing the script! If you place a value into that field, your portal-bot script will not only execute, but the Manager process will also execute the script specified in the POST_IFUP field. This can be really confusing. To get multiple virtual stations logging in an out using the GUI, we just need a few of those parameters for the station configuration. We will use the Batch Modify feature to alter a series of stations. Highlight them and click Batch Modify. 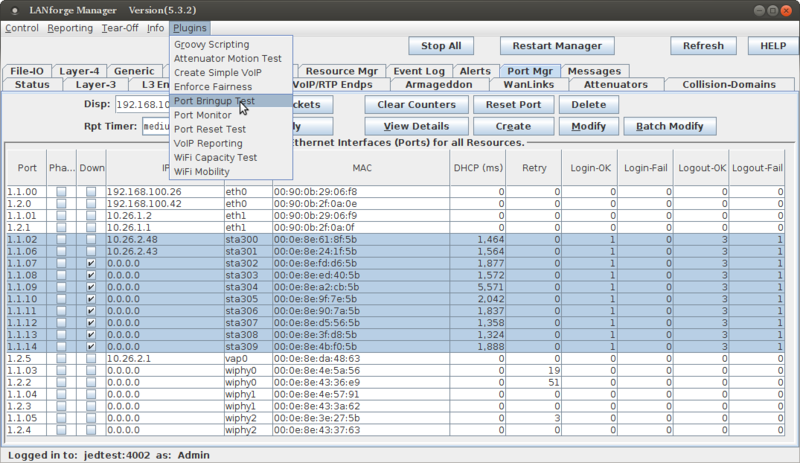 In the Ports tab, double click sta300 and in the Misc Configuration tab, you will see the Post IF-UP Script values. Exercising these stations starts with bringing them up and down using the Batch Modify tool. Highlight one station, sta300, and click Batch Modify. Click the Down button to admin-down the station. Click the Up button to admin-up the station. Click the Portal Login button force the station to login if you do not see any messages in the log file you are tailing. 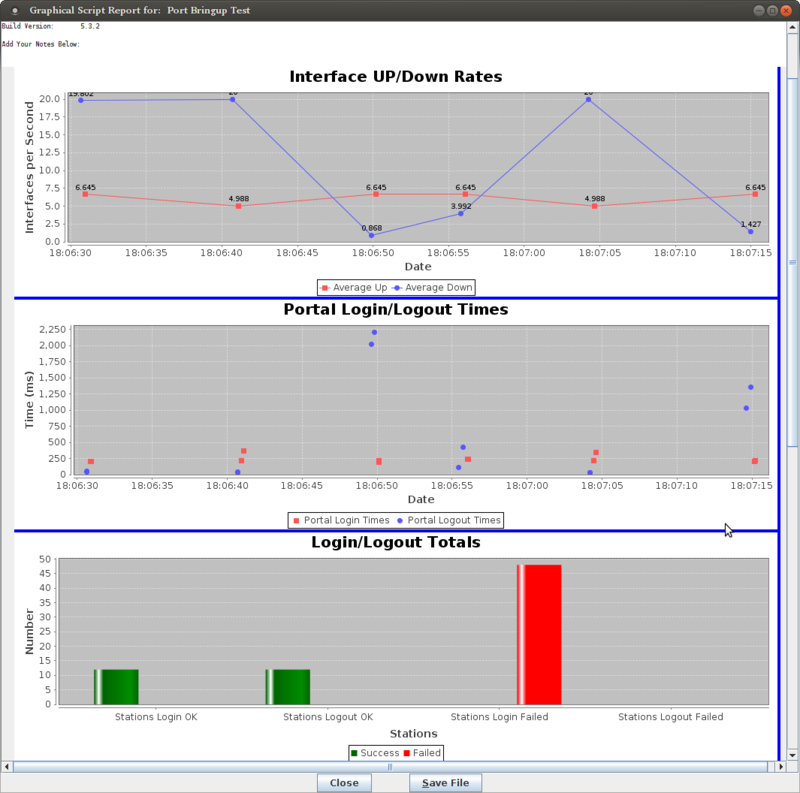 Check access logs for the portal. There might be a hostname issue. 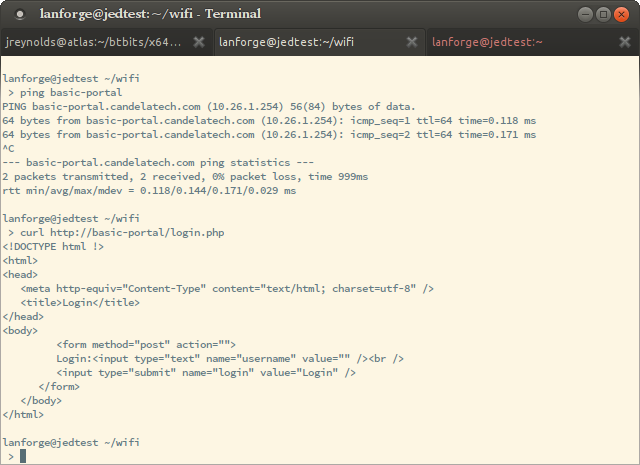 Using the Port Bringup Plugin is a much more fun way to get data than looking at log files. In the Plugins menu, select Port Bringup Test. You will see the reporting window. 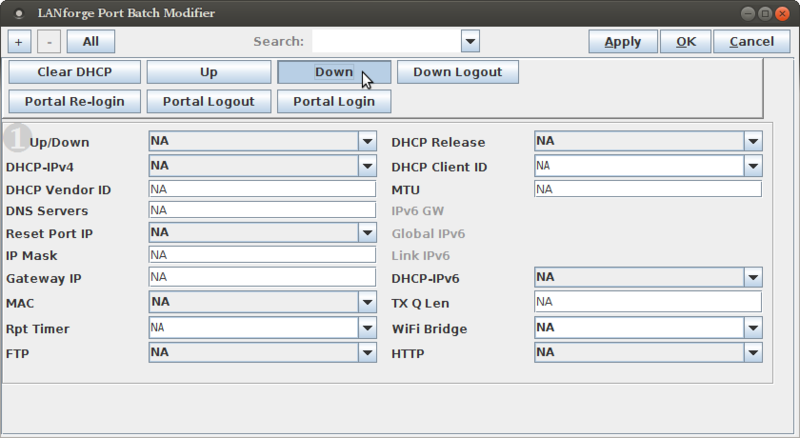 It often takes many seconds or a few minutes for stations to aquire DHCP addresses and start reporting information into the plugin.